When I registered last week for BlogHer ‘11, a conference for [mostly] women bloggers, I was excited about the prospect of networking with over three thousand people from all over the world. But the thought of meeting so many people in one weekend seemed daunting. It’s one thing to work a room. It’s another to work the San Diego Convention Center. I worried. What if nobody notices me? What can I do to make myself stand out? I came up with a few options. I could hobnob with a life-size cut out of George Clooney on my arm. The problem was, it was risky. One, I might get bombarded by the paparazzi. Two, going by the names of the evening parties: “Cheap Sally’s Dance Party,” “Kick Off Your Heels,” and “Kiss My Sass,” I doubted whether “Cardboard Cloonie” would survive the first night. Another option was to create a 3 dimensional hologram image of myself with audio. I could simultaneously schmooze with Becky from Toledo in conference room A and chitchat with Martha from Minneapolis in room B while the real me sipped Cosmos in the cocktail lounge. I also considered handing out business cards. That way, when people forgot my name they’d have a business card to remind them that they still couldn’t remember who I was. I made a mental note to never roast marshmallows with her. Which “hot iron stamp” captured the essence of, “Main Street Musings” blogger? I wondered. What logo said: “Underpaid, rejection, and carpal tunnel syndrome” all in one image? Perhaps the image of a “Main Street Muse,” a curly haired “goddess of humor” draped across a minivan. I looked up “muse” on Google Images, but all I found was lots of photos of naked ladies. Although I observed some creative poses, none said, “humor.” I concluded, “No muse is good muse” and scrapped the idea. The Main Street Musings Blog abbreviation “MMB” could work as a logo, but I decided that didn’t accomplish much (other than providing the Michigan Marching Band free advertising). 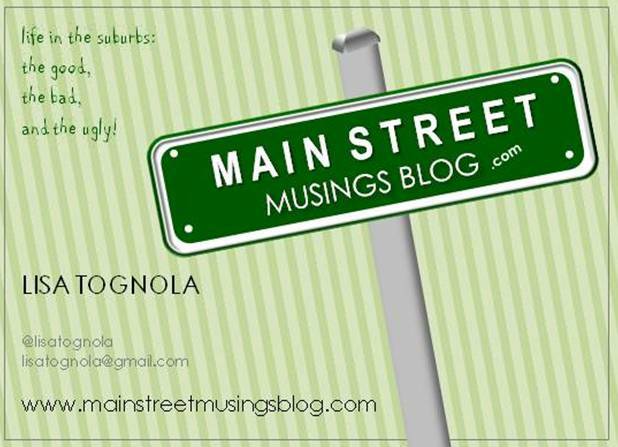 In the end, I chose an image of a whimsical street sign that says, “Main Street Musings Blog.com,” and placed it on a striped green background. I’m hopeful that my business cards will help me stand out in the crowd and lead to plentiful networking opportunities. If not, I’ll go back to my muse idea, this time with a more eye-catching logo: an image of George Clooney. Naked. ← To Beep or Not to Beep . . .
Hmmmmmm, Blogging is of the word, right. Pics are nice, but words are the thing. Wit (and you seem blessed with it) would be the thing to trawl with. Try carrying a sign like my human did at such a meeting. It read, “Can’t somebody tell me where the used coffee disposal device is?” It was truly amazing how quickly he met other humans. Of course, that would do nothing at a canine convention. We just look for grass. Sandy–ah, yes, the power of words. . . I like your word choice: “trawl.” I think i’ll put that one in my back pocket. Sometimes an interesting word like that can inspire an entire piece. Thanks for the inspiration. A cardboard Clooney would have “worked the room” to critical mass with attendees bouncing off each other, drinks spilling from their hands like some cruel human pinball game. A naked Clooney has nuclear implications. Katie’s a smart person, albeit someone who as you said might be a liability around the campfire. Let’s hope my business cards suffice! I would have liked the George Clooney cardboard, but the business card was good too 🙂 Nice meeting you @ BlogHer! Our conversation beat having Clooney on my arm! Very nice talking to you Kelly!